[Austin, TX] August 13, 2018 – Deltek, a leading global provider in enterprise software and information business solutions for services firms and government contractors, announced recently that it has added new partners to its Product Partners Marketplace. 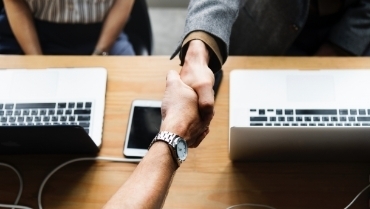 Deltek’s Marketplace is a product partner program designed to connect Deltek customers and prospects with innovative third-party vendors to help solve business challenges. Using this platform, Deltek product partners can showcase and promote their business solutions directly to potential customers. Deltek’s partner solutions encompass the gambit of business roles related to finance, sales, operations, talent acquisition, and video interviews. Among the product partners joining Deltek in 2018 is Live Video Interviews. This innovative startup based out of Austin, Texas provides a SaaS-based virtual face-to-face interview platform for hiring professionals around the world. Live Video Interviews uses its technology to help business reduce their hiring cost, decrease fill time, and increase the candidate experience. Unlike pre-recorded video interviews, remote video interviews allow hiring professionals to gauge, in real-time, a candidate’s culture fit from the comfort of their home or office. Likewise, candidates enjoy the convenience of not having to take time out of their schedule to travel for the interview – especially if they live in another city or country. In a robust job market where competition among businesses to attract and retain high-quality candidates is fierce, Live Video Interviews delivers to companies a game-changing hiring strategy. With Deltek’s help, Live Video Interviews is better able to connect with enterprises to help create their own branded video interviewing solutions. In addition, Live Video Interviews can provide video routing, surveys, and reporting to manage the entire process. The only things required from the business is a web camera and internet access. About Deltek: Headquartered in Herndon, Virginia, with over 2,700 employees worldwide, Deltek is the leading global provider of enterprise software and information solutions for government contractors, professional services firms and other project-based businesses. About Live Video Interviews: Provides a SaaS-based video chat platform for companies to reach today’s busy job seekers. They provide the ability to add video interviewing to companies’ websites or virtual HR within 48 hours. No hardware, no software needed.